As a small startup, we pride ourselves on being agile and reacting to customer feedback. We want the development and prioritization of new features to reflect feedback from our early adopters. Our objective: to keep making your workflow easier and your Trint experience better. That’s why when Vice News and ESPN two of our largest early adopters, came back to us asking if we could create a tool that would allow them to enter their own time-codes on Trints, we listened carefully. We had a lot of similar requests from other broadcasters and podcasters. It was time to act. The first steps were to understand the challenge and map out a solution. Luckily, between ESPN’s team and our own expertise, this was easy. One of the things early users tell us they love about Trint (especially broadcasters and podcasters) is that we do the timings of audio for them. Our timing is 00:00:00 at the beginning of your trinted transcripts. 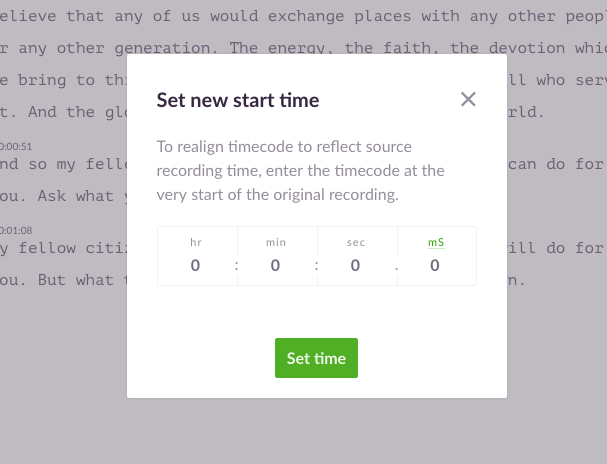 But from feedback we quickly realized that while our time-codes are helpful, what users really want is the ability to sync Trint’s timings with the timings on their source material. This means being able to use the embedded time-codes from the source material in our platform to make sure that the transcript and the media content match. Once we understood that, we focused on designing a solution. In just a few weeks a simple solution has been designed and coded into our platform. It’s simple, but it’s a game-changer for people who use time-codes regularly in their production workflow. And now Trint integrates with it seamlessly. A simple click on the “Adjust” button at the bottom left of the screen will allow the user to input the source start time. This can then be toggled on and off if necessary, and doesn’t affect the transcript in a permanent manner. Needless to say, the initial result makes our team very happy, but we know there’s more to be done on this feature. If you use time-of-day time-codes and there are breaks in the source material, our tool won’t be able to help with that (yet). But for continuous media content, we’ve got your back and we’ll continue improving. Note: The time-code realignment feature is available on selected plans.